Pics After ten years of work by hundreds of scientists, the Sloan Digital Sky Survey III has produced the most complete map of our nearby universe covering over a million galaxies. "We have spent five years collecting measurements of 1.2 million galaxies over one quarter of the sky to map out the structure of the Universe over a volume of 650 cubic billion light years," said Jeremy Tinker of New York University, a co-leader of the scientific team. "This map has allowed us to make the best measurements yet of the effects of dark energy in the expansion of the Universe. We are making our results and map available to the world." The map was made using the Baryon Oscillation Spectroscopic Survey, which measures the size of baryonic acoustic oscillations (BAO) in galaxies as they expand out from the center of the universe. The original BAO rate can be determined by measuring pressure waves from the formation of the early universe which provides a yardstick to measure further expansion. "Measuring the acoustic scale across cosmic history gives a direct ruler with which to measure the Universe's expansion rate," explained Ariel Sanchez of the Max-Planck Institute of Extraterrestrial Physics. "With BOSS, we have traced the BAO's subtle imprint on the distribution of galaxies spanning a range of time from 2 to 7 billion years ago." The map is designed to show the effects of both dark energy and dark matter. The latter substance is thought to provide the gravitational force required to keep galaxies together, while dark energy acts in an opposite fashion to drive the universe's expansion. "We've made the largest map for studying the 95 per cent of the universe that is dark," noted David Schlegel, an astrophysicist at Lawrence Berkeley National Laboratory (Berkeley Lab) and principal investigator for BOSS. "In this map, we can see galaxies being gravitationally pulled towards other galaxies by dark matter. 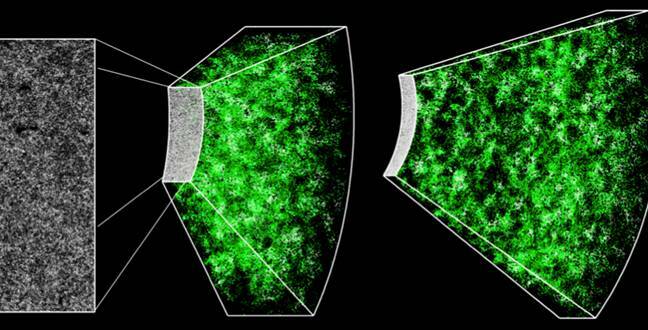 And on much larger scales, we see the effect of dark energy ripping the universe apart." The team said the model appears to confirm today's cosmological models for how the universe grew over billions of years and shows a connection between sound wave imprints formed 400,000 years after the Big Bang and the clustering of galaxies 7 to 12 billion years later. "The results from BOSS provide a solid foundation for even more precise future BAO measurements, such as those we expect from the Dark Energy Spectroscopic Instrument (DESI)," says Natalie Roe, Physics Division director at Berkeley Lab.